Jill Stein is not exactly every liberal’s favorite person lately. But now, she’s gone and raised the necessary funds for a recount which should please many. Or actually, maybe it’s not the necessary amount, she needs more. Yesterday, Stein announced that she wanted to crowdsource $2.5 million to file the paperwork for recounts in Wisconsin, Michigan, and Pennsylvania. This was spurred by New York Magazine’s reporting that a group of computer scientists and election lawyers were urging the Clinton campaign to demand a recount due to suspicions of hacker interference. 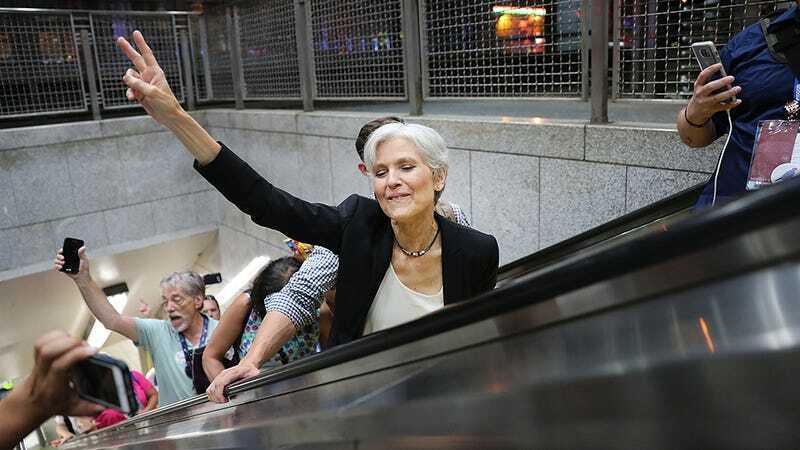 With deadlines for the recounts looming, and sources saying that the White House was just focused on a smooth transition, it was up to Dr. Stein to step into the breach. Clinton supporters need not think that Stein is doing this for them. She’s said that she just wants to highlight the need for greater transparency in our voting process and has called for “publicly-owned, open source voting equipment,” in all states. Okay. So, not there yet. I’m not saying we don’t trust you, Jill Stein, but, you believe that wi-fi may be hurting kids brains—you’re suspect. Frankly, this will probably amount to very little. If Jill Stein actually does achieve a recount in all of those states, it will be a complicated and long process. The group of academics calling for a recount are basing their suspicions on the fact that Clinton “received 7 percent fewer votes in counties that relied on electronic-voting machines compared with counties that used optical scanners and paper ballots.” They admit that this was “probably not” due to cyberattacks.